Despotiko: Southeast view of the Building M and the newly discovered rooms. 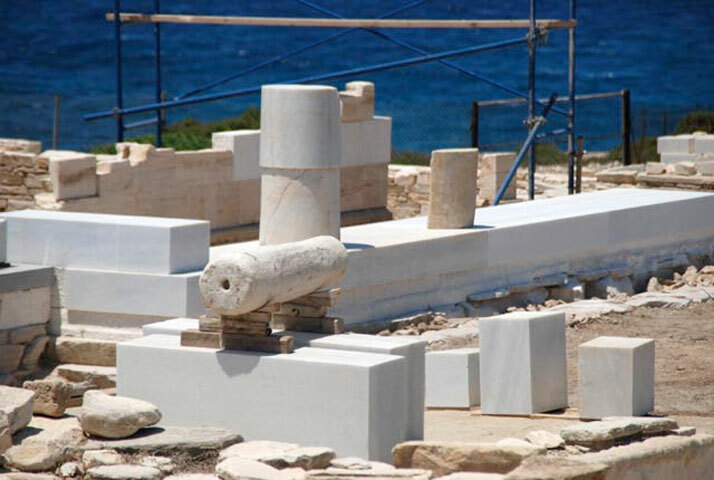 The results of the excavations conducted from May 30 until July 8, 2016 on the uninhabited islet of Despotiko, west of Antiparos (Cyclades), are very significant, shedding light on the history and the topography of the Apollo sanctuary. Systematic investigations at the Mandra site began in 1997 by archaeologist Yannis Kouragios (Ephorate of Antiquities of Cyclades) and have brought to light an extended Archaic sanctuary – the largest known so far in the Cyclades after Delos. Its peak is dated to the 6th c. BC. Until now, excavations have brought to light 15 buildings, ancillary to the temple, and an hestiatorion, a ritual dining hall. The cult center was a temenos protected by a precinct. Here, a marble portico temple and a ritual dining hall were built. Ritual dining rooms were invented by the Parians in the Archaic period. However, the site was in use earlier, in the Geometric period. 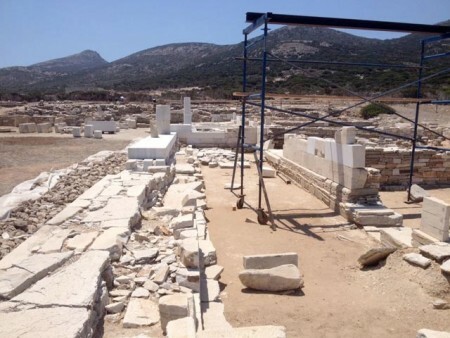 This year, the excavation of the two oldest buildings that came to light in front of the stylobate, the Archaic temple’s platform and the Archaic cult Building Δ. 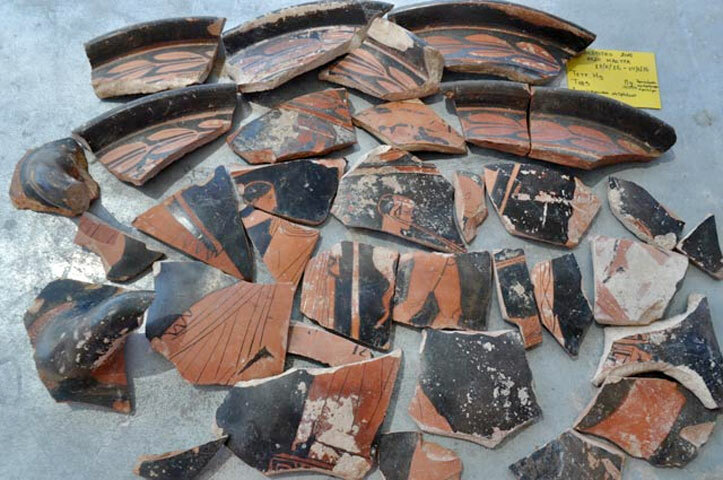 In particular, south of the Building Δ, the excavation of the partly preserved apsidal or ellipsoidal building O, dating back to the late 9th or the early 8th c. BC (Geometric period) has been completed. In 2012, south of the Building O and in front of the stylobate of the Archaic temple, part of the rectangular Building Ξ was excavated. This building dates back to the last decades of the 8th c. BC and it was probably due to this building that Building O was destroyed. 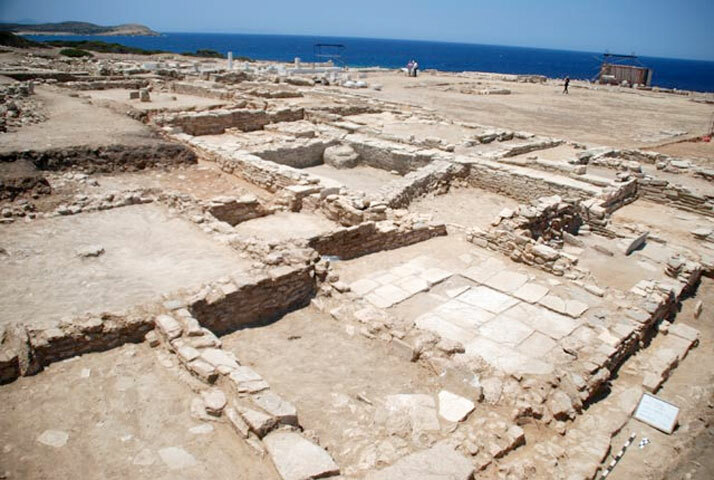 In the north of these buildings, a layer with abundant skeletal remains and decorated pottery sherds came to light, dating from the 8th to the 6th c. BC. This layer was used to build the Archaic Building Δ. Also found within the layer were metal objects, clay figurines, scarabs etc. To the south of the temenos, extended surveys were conducted in the Buildings M and N, which had been partially excavated in 2015. Also, another building came to light, Building Π, with a temple-shaped ground plan, measuring 9.90×6.20m. This building dates back to the 6th c. BC. 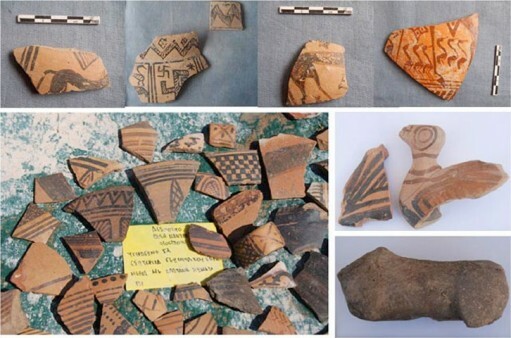 Thus, during this excavation season it has been clarified that from the Archaic period until the Late Classical period, a building complex of 350 sq.m., including Buildings Μ, Ν, Π, was in use. In the atrium of Building M archaeologists found traces of a monumental structure (5×9.5m), with four strong walls of 1.5m height. They believe that the structure served as a cistern, until it was abandoned in the 4th c. BC, when it was buried again with stones and pottery sherds dating from the 7th to the 4th c. BC. Probably at that time, the rooms of Building Μ and the small portico at its south side were built, while the buried structure served as an atrium to this building. At the same time, the four rooms in the south and east of the portico and the atrium were built (these also came to light during this year’s excavations). In two of them, well-preserved pebbled floors were found. Outside the temenos, between the Buildings B and Z, part of another building was located. This will be further investigated in 2017. Furthermore, a strong-built structure came to light, a kind of protective precinct, 25m long and 1.1m wide, built in the Archaic period, when the sanctuary was in use, in order to protect the ancillary buildings outside the temenos. The precinct connected the harbor with the temenos. 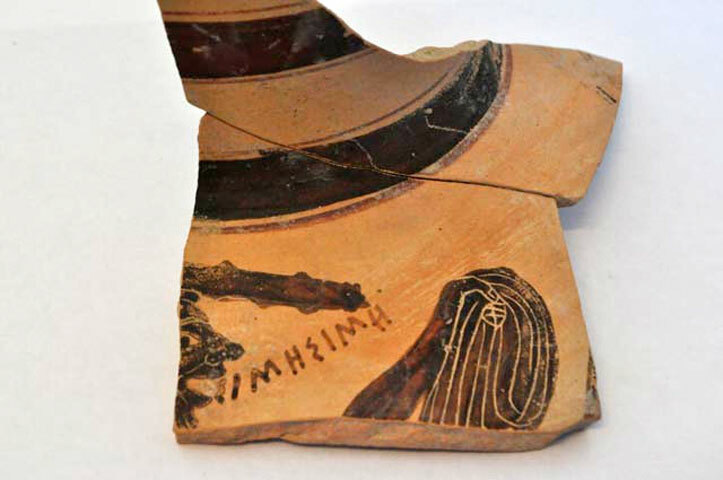 Apart from the abundance of plain and decorated pottery sherds, dating from the late 9th until the 4th c. BC, this year’s finds also include more than 40 lamps, 25 bases of vessels (skyphoi and phialai) with engraved inscriptions of the name Apollo, an inscribed sherd of the 6th c. BC depicting one of Hercules’ labors, sherds of black-figure Archaic kylikes with images of warriors, red-figure kraters of a Classic-era Attic workshop depicting Dionysus, satyrs and maenads, Corinthian aryballoi and alabasters, Geometric zoomorphic figurines, scarab seals, Bronze fibulae and five sherds of the lower limbs of Archaic kouroi. After this year’s excavations, it is clear that the sanctuary occupied a large area of the Despotiko peninsula and attracted many visitors, a fact that resulted in constant modifications and expansions of the site until the Late Classical era.